Just in case you missed any of it, here is a brief rundown of the last 12 months at the Scots College, Rome. The 2016/2017 academic year for the Scots College in Rome has drawn to a close with the ordinations of two men as priests in their respective parishes. On Friday 30th June, Fr. 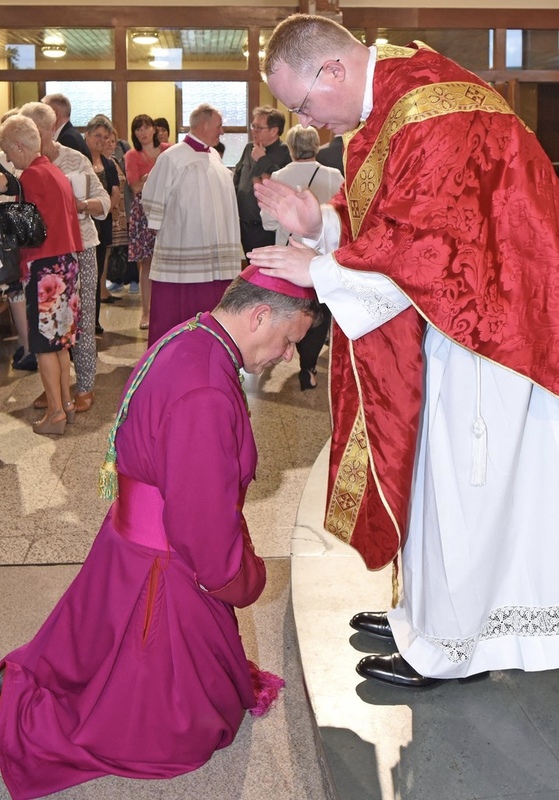 Bernard Mournian was ordained at St. Mary’s, Hamilton by Bishop Joseph Toal, whilst later in the same day, Bishop John Keenan ordained Fr. Jonathan Whitworth in St. Andrew’s, Greenock. Both occasions were celebrations for the parishes, dioceses and college where both men have lived and studied for the past seven years. They will now be appointed to parishes for ministry in Scotland. Meanwhile, ordained last year, Fr. Matthew Carlin, has completed his studies and returns to the Diocese of Paisley. Another leaver this year is Paul Opatah who has lived in the college for the last two years completing studies in Rome before returning to the Diocese of Oslo for his diaconate ordination later this summer. The exodus of the college is not just limited to students. It was announced in May that Fr. Gerald Sharkey would be returning to the Archdiocese of Glasgow as Administrator of St. Andrew’s Cathedral and two of the community of Francisican Sisters who live and work in the college, Sr Stella, who has been in the college for 8 years, and Sr. Augustina, who has been in Rome for two years, have both left for new ministries. Whilst all of this has happened in the past few weeks, the rest of the college year has been equally busy. The year began in the Jubilee Year of Mercy with visits to St. Mary Major and St. John Lateran to complete the college pilgrimages to the four Papal Basilicas and Holy Doors. Various diocesan and parish groups visited the college during the final weeks of the Holy Year, including the Diocese of Motherwell, the Schola Benedicti and the Archdiocese of St. Andrews and Edinburgh, who visited for the official end of the Year of Mercy in November. Also in November, the community began a new tradition by celebrating Sunday Mass at the English College before joining their hosts for lunch. That same day a tradition continued with a visit to the college tomb at Campo Verano. November also included the installation of new Acolytes, a place in the final of the regular 5-a-side Irish College tournament and the annual celebration of St. Andrews Day when we welcomed priests celebrating landmark anniversaries that totalled 220 years of witness to the priesthood. Monsignor Marini pictured during his visit to the college in January this year. The New Year began with a visit from the Papal MC, Monsignor Guido Marini, who celebrated Mass for the community, joined us for supper and then spoke about the work of a Papal MC and the importance of liturgy, as well as answering questions from students. Also in January, the traditional Scots College Burns Supper took place with guests descending from across the city – and further afield. Iain MacGillivray, the Commander of the Clan MacGillivray provided the bagpipe accompaniment for the night and toasted the haggis. Following the winter exams, the second semester began with the then Decano, now Fr Bernard, being one of a few students invited to meet the Pope Emeritus, Benedict XVI. The invitation was extended as Fr. Mournian had completed a study of the works of Benedict and his work – along with his fellow students – was presented to the Pope Emeritus. The newly ordained deacons pictured with College staff, senior students and the Most Reverend Hugh Gilbert, Bishop of Aberdeen. For the most holy night in the Church’s year, The Easter Vigil, the Scots College had been invited to serve the Papal Mass in St. Peter’s Basilica. The honour, which rotates around the Roman colleges, returned to the college on this occasion for the first time in several years. Following quickly on from Easter this year was the ordination to the diaconate of three men from the college, Emmet O’Dowd, Rafał Szweda and Emmanuel Alagbaoso were ordained in the college chapel by the Most Reverend Hugh Gilbert, Bishop of Aberdeen. By the time May dawned at the college, the community was gearing up for another fundraising effort for Mary’s Meals. The annual quiz night raised over €2000 and was followed swiftly by a shift in emphasis. As Good Shepherd Sunday fell on the weekend of 7th May, the community gathered to take time during a period of 40 hours adoration. As the end of term neared, the events kept on coming with the visitation by Archbishops Tartaglia and Cushley. The Archbishop of St. Andrews & Edinburgh installed four new Lectors during the week long visitation, an event which was followed two weeks later by the admission of three men as Candidates for Holy Orders, the final step before their diaconate ordinations next May. This is just a brief rundown of the events that have been taking place over the past nine months at the Scots College in Rome. The whole community would like to thank the many generous benefactors to the college for their continued support in 2016/17. Without your support the training of seminarians for priestly ministry in Scotland would not be possible. We ask you to continue to keep the whole community in your prayers. If you would like to help financially support the work of the college, then please visit the benefactors section of this website where you will find all the information you need.